Don’t worry if you missed the sales on Black Friday, Small-business Saturday, and Cyber Monday. There are still deals to be had over the next 30 days until Christmas. They may not be as obvious as some of the stores’ doorbuster deals on Black Friday but if you do your homework you will find them! This time of year, price shopping is the most important aspect. Stores are competing for your business during the season, so the prices sometimes are as varied as apples in an orchard. Shopping prices doesn’t mean you have to hit every store in search of the lowest price, it simply means a one-stop shopping trip on your computer to search for the lowest price. Online sites make comparison shopping so easy and pain-free. Of course, you can always do like my youngest son did on Black Friday: He packed along his trusty little notebook and pencil so he could jot down ideas for his Santa list but he also kept track of the prices for the toys at each store. I am sure Santa will be very pleased that Gus did all the work for him! Erin’s son takes down prices and comparison shops for his Christmasgifts. Retail powerhouses like Amazon, Overstock, and other .com stores are vying for your business with low prices, free shipping, and lots of added benefits. If you like avoiding the crowds and the hassle of going out, online shopping may just be your cup of tea! But just be sure to compare prices before being wooed by these retailers. For example, I’ve been shopping for a techy gift for one of my sons. I assumed Amazon would have the lowest price but I found it locally for almost $50 cheaper. Most online retailers will be offering free shipping until December 17, so be sure to take advantage of that savings! If an online store isn’t offering free shipping, check out retailmenot.com. This is a website that gathers all the coupons and promotions for numerous online merchants in one place. Type in the online store you are wishing to buy from and see if there are additional savings or free shipping codes for you to use. I always do this when I shop online and I have saved hundreds of dollars with their coupons and promotions. Also, be on the lookout for added bonuses this time of year. At Target, they are offering gift cards with the purchase of many items. These bonuses add into your savings even though their price may not be the lowest. Another theme I am noticing is retailers offering price matches. This saves you the rat race of running around from store to store. Price match means a store will meet the lowest price out there on the exact item, which is not only money-saving but also time-saving! Target, for example, offers gift cardincentives. And don’t forget coupons! Scour the web for coupons for various stores. I loved the one I found on Coupons.com for 50% off an item of $30 or less at Ace Hardware. It was a super deal AND it gave me the chance to support a local store. Don’t forget about checking out a retailer’s Facebook page, they usually have some great promotions on there! 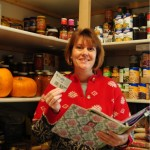 Check out the local paper or other local publications for coupons to local stores. Checking out the websites of stores is also a smart place to search for coupons or promotions at your chosen store. Believe me when I say that most stores have some sort of coupon or promotion going on during this joyous season! Do you use Foursquare? I just recently read about it, but heard that last holiday season, people who logged onto Foursquare and then went into the Payless Shoe page got 10% off their purchase. Those who did it at Sports Authority got $25 off a $100 purchase. I’ll be checking this site out a lot more this week! Be sure to see if your credit card company is offering any promotions this next month as well. Many of them, offer a discount at various retailers or online sites. Don’t miss this chance to save some more cash on Christmas gifts. You can expect to see additional discounts at most stores this next month as retailers are working hard to reduce their Christmas stock inventory. So, just because Black Friday is over doesn’t mean you missed all the deals. Each week you should be seeing some great deals and buying incentives!